Our Single Track Form Fill & Seal Machine is available in Model No. - (IF-200). Single Track Form Fill & Seal Machine with Model No. - (IF-200) is a Continous Single track FFS Machine. 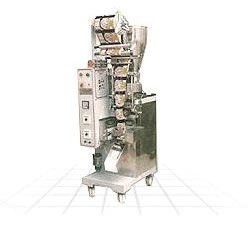 Single Track Form Fill & Seal Machines that we offer are suitable to pack powder and granule products packing like milk powder, soya powder, coffee powder, confectionery, pulses, spices, tea, sugar, etc. Single Track Form Fill & Seal Machines, offered by us, are the best to pack up to 100gm. Vivek International is a noteworthy Manufacturer, Exporter and Supplier of Industrial Machines in Faridabad, Haryana (India). Our array of Industrial Machines comprises of Flow Wrapping Machine, Zipper & Standy Sachet Making Machine and Form Fill & Seal Machines. We use product contact part S.S 316L and other MS powder coated material for manufacturing our machines. We specialize in liquid, paste and powder filling systems for Pharmaceutical, Detergent, Cosmetics, Personal care, Tobacco, Food & beverages products specialty industries. All our machines are designed for efficient and economical operation to meet automated and high-speed needs for packaging anywhere in the world, thereby eliminating manpower application in totality. We are an ISO certified company maintaining high standard at every stage of production. Organizational depth, strong infrastructure, proven processes, and a strong commitment to service enable us to keep our commitments with the clients no matter where our production facilities are located. For quality assurance, all machines are operated and thoroughly tested by the Quality Control before shipment. If a problem ever develops, the respective Quality Control personnel take a quick necessary action. We have the ability and experience to customize, fully integrate, and/or modify any of standard line of automatic machines for applications. Engineered for consistent package quality, quick and simple product changeovers, flexibility, and low maintenance, our packaging machines are custom tailored to meet customer specifications. We are known to offer quality products at the best price. We are also considered the best for timely and safe delivery of consignments to the customers.